The other night I dreamt I was driving down the coastal road in my hometown of Palm Beach, Florida. I passed a towering palm, one I’m certain doesn’t exist, with a ladder nailed into its trunk. High above the cottages and just below the umbrella of shocking green fronds, a treehouse had been built. It was as impossible as it was rustic—just three walls, a floor, a ceiling and some sparkling lights. It was everything I could ever want. My dream was no doubt conjured from spending time talking treehouses with Pete Nelson, the host and lead designer/builder on Animal Planet’s Treehouse Masters. Of course, my treehouse was absolutely nothing like what you’ll witness on an average episode. During its 10 seasons on air, Nelson has traveled across the country to create dozens of shockingly elaborate treetop mansions, music studios and guest rooms. Nelson even built a workshop for Santa. These days, he’s dreaming even bigger. During our chat, he gave updates on his latest treehouse-building escapades and where his treehouse journey had taken him. He even shared the lesson he’d give to all the amateur builders out there. Nelson is more than just the host of his own wildly successful show. Nelson’s bio notes that he’s had a love for treehouses since he was just a sprout. While he originally went to college for economics, he soon found his post-college life wouldn’t satisfy him unless it kept him connected to the trees he loved so much. His first endeavor in the treehouse business: Nelson wrote 1994’s, Treehouses: The Art and Craft of Living Out on a Limb. The first of five treehouse-related books, his debut set him on course to be the country’s most famous and knowledgeable treehouse builder. But Nelson is adamant that the most important job of a treehouse isn’t luxury—it’s escape. These days, Nelson is dreaming of escaping, too. Costa Rica is just a drop in the bucket for Nelson, though. Traveling across the globe to build treehouses for others isn’t Nelson’s only enterprise. Another not-so-secret endeavor is his one-of-a-kind (in America, anyway) Treehouse Resort and Spa, currently under development on 23 acres of property between Redmond and Woodinville, Washington. (According to its website, the resort is slated to open for special events this summer, with construction on 20 “custom-designed, handcrafted” guest treehouses scheduled to begin in 2018.) Why would a man who spends most of his life building treehouses for others also want the responsibility of owning a collection of treehouses of his own? All of which, in essence, will be rented out on a nightly basis to perfect strangers? No matter what angle you take when looking at Nelson’s treehouses, escapism abounds. From his clients’ desire to climb a tree and escape the hubbub to Nelson’s own bouts of country hopping, all signs point to an urge to disconnect from the “real world” and reconnect with nature. As Nelson points out, though he doesn’t always play a tangible part in the average person’s escape, Treehouse Masters has served as quite the inspiration. As for words of wisdom to the parents, grandparents and extended family members out there building treehouses in the name of love, Nelson suggests the website for Nelson Treehouse and Supply, which features information on how to tackle treehouse-building projects, and his books—the latest of which, Be in a Treehouse, showcases some fantastic builds across the world and gets into the nitty gritty technical aspects of building. 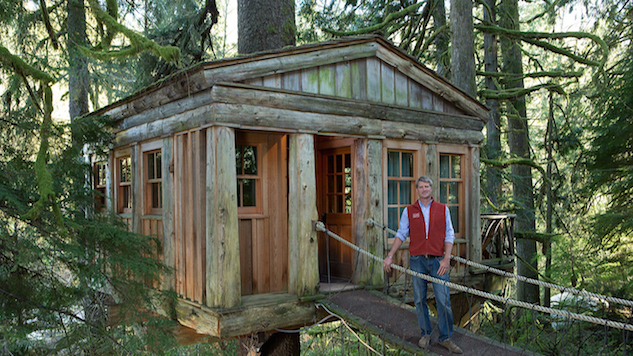 The new season of Treehouse Masters premieres tonight at 10 p.m. on Animal Planet.